I’ve spent the entire summer upping my game in the zucchini bread department. To say my loaf is perfect is subjective; my criteria was that it had to be different. I wanted whole grain flour and honey, and possibly a crunchy top that you could pick at while the loaf cooled. And because I’ve been obsessed with walnuts for the past year, I specifically envisioned them as a textural adornment (fit for a squirrel!). 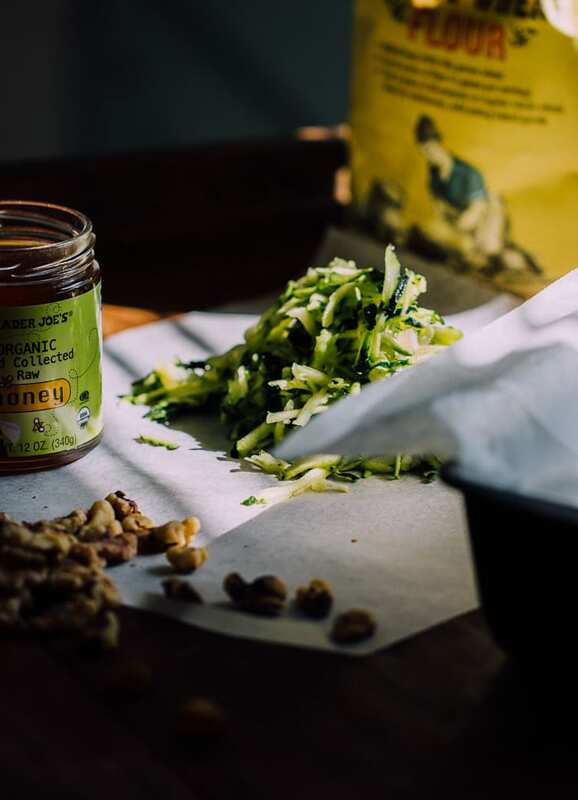 Did you know walnuts contain a good amount of omega 3’s? I snacked on walnuts every single day with Greek yogurt, blueberries, and honey while writing my cookbook. My body craved it. So does this zucchini bread. 1.) When zucchini is local, fresh, and in season it will contain a good amount of water. This can wreak havoc on your recipes. To combat this, most recipes require squeezing out any excess moisture to prevent sogginess. On the other hand, out of season or particularly large zucchini tend to be more dry. However, because my zucchini bread is made with whole grain flour, I skip the squeezing step. Whole grain flours actually need the extra moisture (they absorb more liquid when compared to all purpose flour). 2.) Shredding zucchini with a box grater yields different results than shredding via the food processor; it’s more watery. You can feel the difference in your hands when you compare the two, which is what I did. I first discovered this while preparing this recipe. One shredding method is not necessarily better than the other. It’s just something to keep in mind. You might have to make adjustments as needed, adding more flour and/or liquid to your recipe as you go. I chose to shred my zucchini with a box grater this time. I replaced all purpose flour with white whole wheat flour (see kitchen notes below) and threw in some quick oats for texture. Because quick oats are partially cooked, they will seamlessly absorb into the batter far better than thick old fashioned oats. No cardboard bread please! For the sweetener, sugar was replaced with honey and for the spices, cinnamon, ginger and a dash of nutmeg join the party. Or in other words: everything in the spice cabinet that smells like fall. Plump golden raisins and walnuts were folded into the batter and sprinkled over the top. 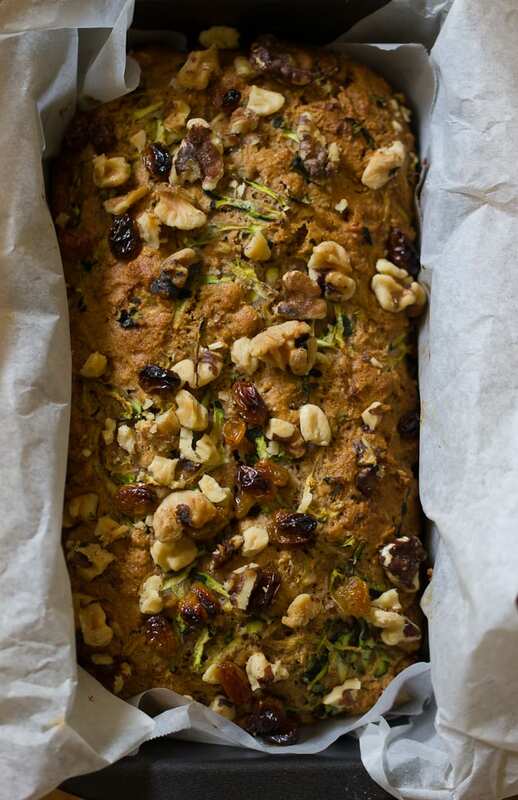 This zucchini loaf is lightly sweet, subtly spiced and and full of soft and crunchy bits. What have you been baking lately? Ever become obsessed with perfecting a recipe? Baked goods with honey will brown faster than those made with sugar. 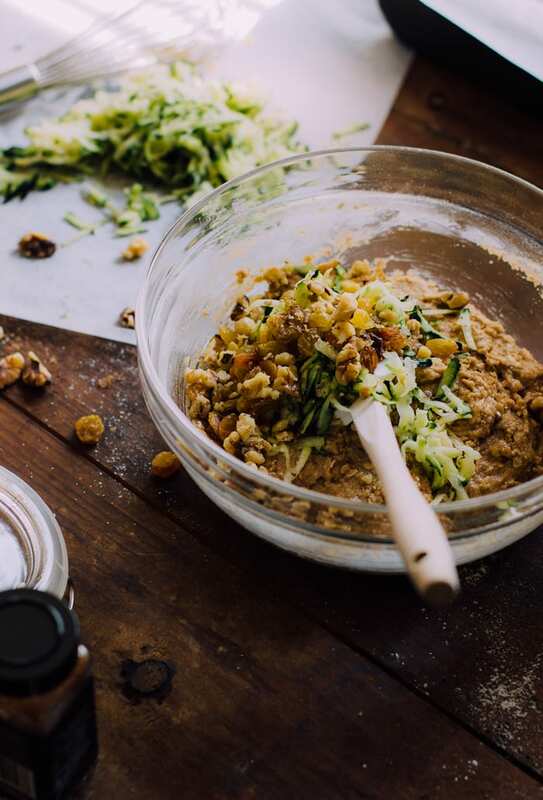 Keep an eye on your zucchini bread as it bakes. If you’re using in a glass 9×5-inch loaf pan, reduce the oven temperature to 325 F. This way, it won’t brown too quickly. I use ‘white’ whole wheat flour. It’s more mild than traditional whole wheat flour and lighter in color. In my opinion, it tastes somewhere in between all purpose flour and whole wheat flour. Walnuts can be pricey. Trader Joe’s carries walnut (and cashew) ‘pieces’ which are considerably cheaper (you’re going to chop them anyway). Check you local grocery store to see if this is an option for you. And on that note, if you don’t like nuts and raisins simply leave them out. It will still taste good either way! Preheat your oven to 350 F. Line a 9x5-inch loaf pan with parchment paper for easy removal. Using a box grater, shred the zucchini. and set aside. Do not squeeze out the excess moisture. Add all of the dry ingredients to a large bowl. Whisk thoroughly to combine. In a separate mixing bowl, add all of the wet ingredients. Whisk until fully blended. Combine the wet and dry ingredients. Don't over mix- the bread will be tough! Gently fold the golden raisins and walnuts into the batter. Add the shredded zucchini, reserving a pinch or two to decorate the top of the loaf. Pour into your lined loaf pan. For the topping, scatter the rest of the raisins and walnuts over the top. Tuck them into the batter to prevent burning. Bake for about 40-60 minutes, checking at the 40 minute mark. A toothpick should come out clean when inserted. Cool for 10 minutes in the pan and then transfer to a wire rack to finish cooling. I love how jam packed with stuff this bread is! So tasty! I love zucchini bread. In fact, I just posted it yesterday. 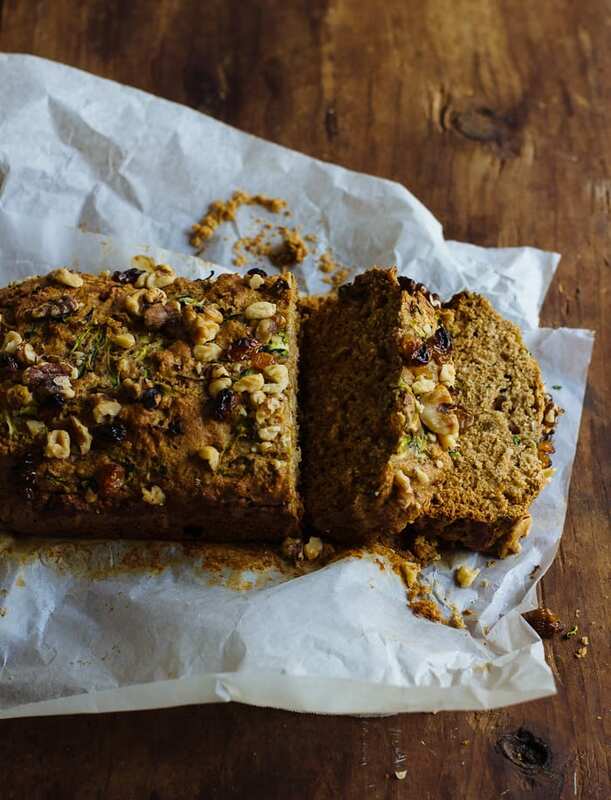 Now I want this loaf- with the wheat flour and oats and honey. I bet this would be perfect for coming fall days. I’m all about the extra nuts, the extra raisins, everything extra. I liked your zucchini notes, I didn’t realize that shredding in the FP or on the box grater yielded such varied results. Good to know! Yes, extra to everything. I like your style! Emilie, I LOVE baking with zucchini! 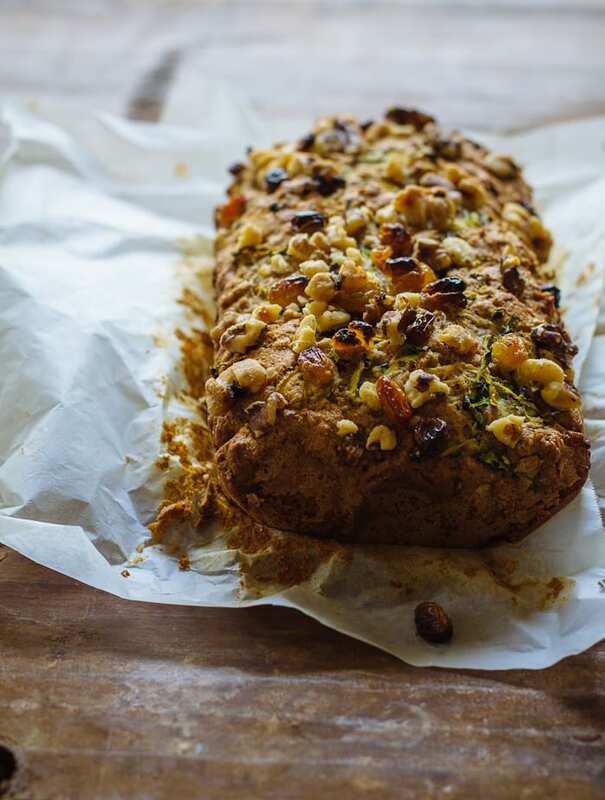 the whole grain flour and honey and the crunchy top . . it’s like a party on top of this zucchini bread! I love this. . and love the tips and facts! I and my husband by like anything crunchy and sweetened with dried fruit. Our son, on the other hand, does not. Would dates as an alternate to the raisins add extra moisture to the bread? 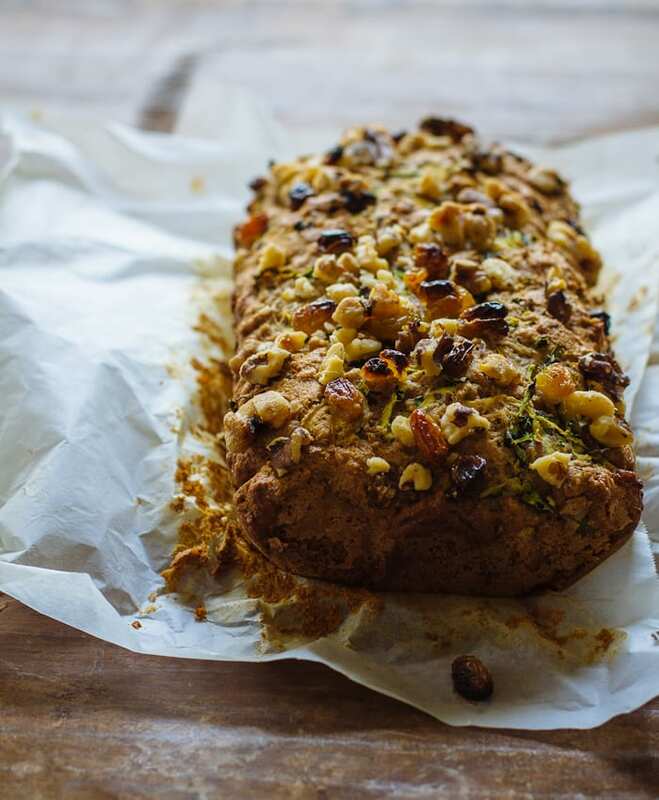 Such a perfect loaf, love the whole grains and that pretty topping! Thank you, Laura! You’re so sweet! As for obsession with perfecting a recipe? That’s gotta be hummus. I make it SO often, but I’m always searching for ways to make it better! My current version is made with homemade infused lemon oil (just EVOO with lemon rind infused into it, so delicious) and topped with za’aatar. Now do tell me about your hummus- do you peel those pesky skins? I’ve done that once and vowed never to do it again. But, on the flip side, it does make for the most delicious and creamy hummus I’ve ever tasted. Your version with homemade lemon oil and za’aatar (why so many a’s? lol) sounds divine. I know what you mean trying to perfect a recipe or come up with new ideas. 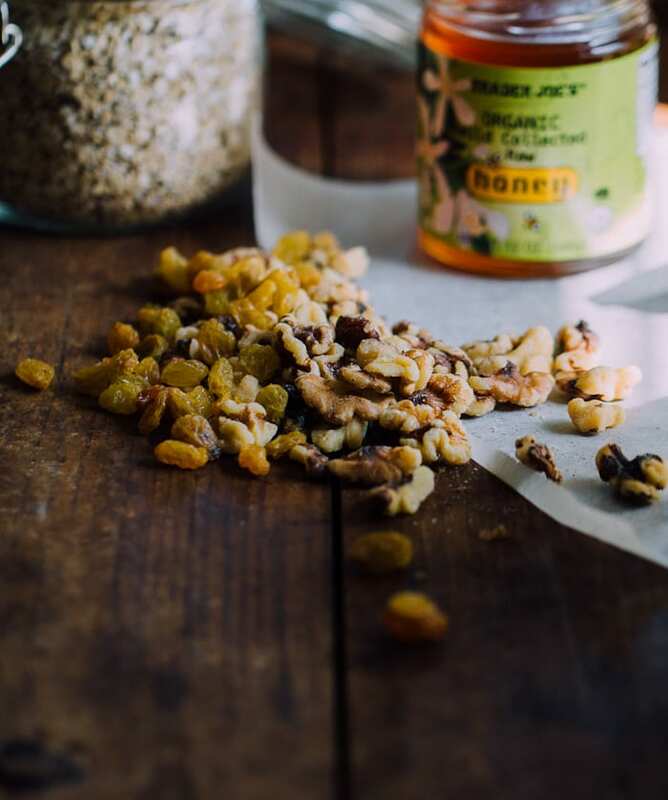 Love the crunchy goodness here and the addition of honey! What a gorgeous recipe! 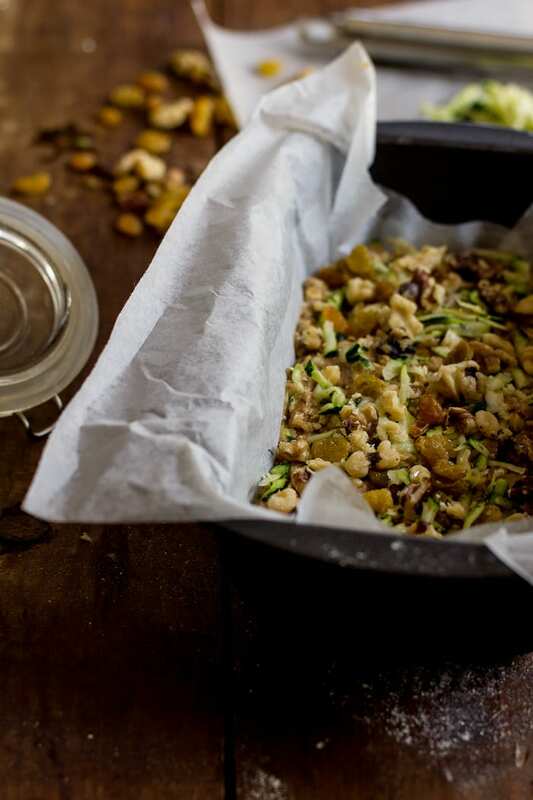 I’m loving this honey walnut idea and would take a zucchini loaf any day. I want the whole dang thing for breakfast! Love your new word. I do that all the time! It’s all about the crunchy bits! I mean, what else are you supposed to do while the loaves cools… stare at it? I’ve been making the same loaf of zucchini bread for the last 3 years and I am so ready for a change.. This looks like the perfect recipe for me to bust out of my slump with. :) That topping! Thanks, Donna! It really is hot, isn’t it? We still have a ton of tomatoes (sun golds) in the garden and it just doesn’t feel right going pumpkin! Although, I did have a pumpkin muffin at Whole Foods today… if you can’t beat ’em, join ’em! Do you think this could be made in a bread-maker machine? I just made some milk and honey bread last week that was super yummy but not very healthy ha! First of all, I love your blog name ;) So glad to know I’m not the only one who rushes through the cooling process! Thanks for stopping by, Kristy! I dont’ think that knobbly, delicious topping will last until the first slice. Thank you Emilie, I love all those good for you ingredients. My zucchini are waiting…….. I had no idea that zucchini shredded with grater would release more water compared to the one shredded with food processor. A great tip to keep in mind. Thanks for sharing. Sending you lots of hugs my friend..
Our CSA box has had lots of zucchini lately, and I love it, but wanted to do something different with it, but healthy. This recipe was just the ticket. Thanks so much for your delicious inspiration. Everyone loved. it. This sounds delicious! I am, however, currently looking for recipes that call for fresh pumpkin. Could this be done with pumpkin? If so, fresh grated, or already baked? Made this recipe into muffins last night and omg they are delicious!!!!! Super moist and yummy. Looking forward to trying out more recipes! Thank you for this delicious recipe! I have made it three times this past month! It was your beautiful picture of the bread that caught my attention! However, the first time was a flop! not squeezing the zucchini didn’t work well for me. There was too much moisture and it didn’t bake throughly. The second and third time I used a fine grater and squeezed the zucchini dry. The bread turned out very light and fluffy! Hi, I only have old fashioned rolled oats. Can I omit this from the recipe? What do I replace the oats with? Thanks! I haven’t tested this recipe otherwise, but you can try using old fashioned oats or perhaps swapping oats for flour. In either case, if the batter is very thick, you might want to increase the liquid to compensate. Hope this helps! The bread looks good! Can this recipe be changed to making muffins? Do I just need to adjust/reduce the time? Also, I just bought a container of old fashioned oats. What would happen if old fashioned oats were used instead of quick oats? Can I pre-cook the old fashioned to save from buying some? Thanks! Hi Emily! Besides asking about the oats and making the bread into muffins, I forgot to ask if it makes a difference to use 2 large eggs instead of 2 x-large eggs? Do I need to add more liquid of some-kind? Hi I made this for a recent bake sale at work thinking it would be a healthier alternative for some to all the chocolate muffins, this went off the trolley first and some came back for more! A great success I think thank you for sharing the recipe.